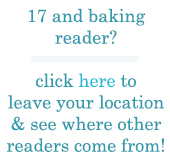 Ever since I’ve begun blogging, I’ve noticed that 17 and Baking does have an effect on what I make. I still daydream about unusual flavor combinations and sketch out cupcakes in class, but I’m also influenced by what I’ve already done. I realized that I also try not to repeat myself, despite the clear trends in my preferences. I can’t resist pumpkin, basil, and blood oranges, but their appearances on my blog have been limited since I always try to keep things different. I find myself aiming for new recipes instead – I can’t blog about something I’ve already made! But I’ve found that some of my favorite desserts, the creations I’ll ultimately keep closest to my heart, have been the ones created not for my blog, but for my own life. Maybe it’s because I like the creativity and the challenge of it all, or maybe it’s because I just love to see how people light up when they’re happy… Whatever the reason, I think birthday cakes are the most fun to make. I love designing and baking birthday treats especially for my friends based on what they like. I think about whether they’re a chocolate or vanilla person, and whether they’d like buttercream or ganache. Beyond taste, the best part is deciding how to decorate whatever I make. I try to really think about what my friends are like, what makes them the happiest, and what would really make their day a little sunnier. So when I set out to make these these Chrysanthemum Cupcakes for my artist friend M-, I already knew what I wanted to do. I wanted to make something as beautiful and light as her art, something that was really “too pretty to eat.” I also wanted to make something as delicious as attractive, so I made chocolate cupcakes filled with meyer lemon curd. Then I used my favorite swiss meringue buttercream to pipe each petal on top. One of the most frustrating things is when the vision in your head doesn’t match the dessert you produce. I can’t tell you how many times I’ve started out with a gorgeous picture in my head… and then four hours later, my counter is covered in granulated sugar and I’ve got food coloring on my nose and a temper. But these cupcakes came together without trouble. Nobody was more surprised than me when the flowers emerged from the piping tip petal by petal, delicate and smooth. The bouquet of cupcakes on the table put a smile on everyone’s face when they walked by… I hope they brightened M-‘s birthday too! Update – recently I wrote this article for the Seattle Times. The recipe at the end features the piping technique from this post. A few days after publication, I got an email from Lisa of West Seattle. She and her daughter made the cupcakes, shared them with friends and family, and emailed me this lovely poem about them. I got her permission to share it here. bulb-bursting and shooting for the clouds. Because this is not a plate of cupcakes. These cupcakes are the quintessential American chocolate cake: light, moist, and full of chocolate flavor. They’re a snap to make and worked great with the buttercream. As for the meyer lemon curd, I picked a recipe that didn’t require a ton of yolks, and I couldn’t have been happier with the results. It’s thick and tart – maybe a little too tart on its own – but paired with the chocolate cupcake and flower of frosting, it was a perfect complement to the sugar. Preheat oven to 350F. Line 36 cupcake tins with paper liners. Sift the flour, sugar, cocoa, baking soda, baking powder, and salt into bowl of a stand mixer fitted with a paddle attachment. Mix on low speed to combine the ingredients. In another bowl, gently whisk together the buttermilk, oil, eggs and vanilla extract. With the mixer on low speed, slowly add the wet ingredients to the dry ingredients and mix to combine. With the mixer still on low speed, add the coffee and stir just to combine. Scrape the bottom of the bowl with a rubber spatula to make sure everything is well combined. Fill cupcake tins 3/4 full (I like to use a little cookie/ice cream scoop) and bake for 15-20 minutes, or until a toothpick comes out clean. Cool on a wire rack. Grate 2 teaspoons of lemon zest and squeeze 1/2 cup of juice. Whisk together zest, juice, sugar, and eggs, then add the butter pieces. Set over a saucepan of gently simmering water and whisk until smooth and thick, 160 degrees F on a thermometer. Strain curd through a fine sieve into another bowl, cover with wax paper, and cool completely. Using your favorite buttercream (I used my favorite Swiss Meringue Buttercream), set aside a small amount and dye it green with food coloring. Smooth a small amount into a thin circle on the top of the cupcakes – don’t worry about the center, just focus on the edges of the cupcake. Take the remaining buttercream and dye any colors you want for the petals (I chose light pink and yellow.) Fill in a piping bag fitted with a coupler to easily change tips. Start with a No. 12 round tip and pipe a 1/2″ round dot on the center of the cupcake. Switch to a No. 80 tip (I used a No. 81, and this is the tip that looks like a “U”). Hold the tip at a 45 degree angle next to the dot. Squeeze and pull out in a quick stroke. Continue around the dot, then make a second, third, and fourth layer of petals on top of the first, making the petals shorter each time. Finally switch to a No. 3 tip (a tiny open circle) and pipe three little dots on top. Entry filed under: Cake/Cupcakes. Tags: buttercream, cake, cake decorating, chocolate, frosting, fun celebration cakes, lemon. How great, I need a chocolate cupcake recipe! My church is doing a chocolate auction for a fundraiser, and I wanted to make cupcakes. Unfortunately, I don’t think I have your patience to make those beautiful flowers- I am NOT known for my piping skills. Hi, I didn’t know how to contact you so I left a comment here. I like to invite you to http://www.tasteandshare.com, a food & wine social network, where you can share photos, videos and a link to your own blog. These are decorated beautiful! You did a great job. your blog is completely amazing… i can’t believe you’re just 17… congrats on such a good job, those flowers are amazing! keep the baking on! Those chrysanthemums are GORGEOUS. I’ll have to try that for sure on some cupcakes once spring comes! Just gorgeous. What a fabulous birthday present! So. gorgeous. I love your blog so much, partly because I’m from Seattle, and partly because you’re a terrific writer, photographer and baker, and partly because you just sound like the kind of person I’d love to chat with. Keep it up. Wowwww! Gorgeous. Did you find these hard to transport?? Noelle – I have a cheap cake carrier that I use to transport all my baked goods. I once made the mistake of trying to transport a 3 layer frosted cake all on my own. Long story short, it was smushed against the sides of the cake carrier as I exited the freeway. These days, I ask someone else to drive, and I hold the cake carrier in my lap. My dad is a pretty smooth driver, so I didn’t have much trouble with these cupcakes. oh my gorgeous and really too pretty to eat! u are amazing! These cupcakes look amazingly beautifuil. Almost toogood to eat. Congrats on the blog award nomination. I know you will win. These cupcakes not only sound delicious but they are stunning! You got skillz girl! Wow- these are gorgeous! I’d love to have some of these at my wedding! Amazing! Definitely too pretty to eat. Those must have been so much work. I’m glad it all paid off. YOU are the artist here, this is so dainty and beautiful! Hats down to you my friend! Anyway, I have just developed a passion for baking, however my mum hates it when I’m in the kitchen because I mess up the whole area. I just love how beautifully you’ve decorated these cupcakes. I am planning to try this technique soon…er, after I purchase the right sized tips. Thanks! I love the decorating on these cupcakes and they sound like they taste great too. You are so skilled. Good luck with the baking. That’s excellent piping. Makes me want to whip up some icing and practice. How do you get your cupcakes to look so uniform?? Not necessarily the buttercream (which is gorgeous!) But the cake itself? I’m having so much trouble with this! Hey! Ijust wanted to ask if you ever have any problems with hackers? At this time it sounds like Movable Type is the preferred blogging platform available right now. methods. It has the highest ROI (Return of Invesment) in all advertisement channels. Very useful info particularly the last part :) I care for such info much. finish I am reading this fantastic post to increase my experience. the Captain Cook Hotel which is named after Sir James Cook, the first person to arrive in the island on Christmas Eve of 1777. The aircon and heating system is one of the most neglected parts of a residential home.